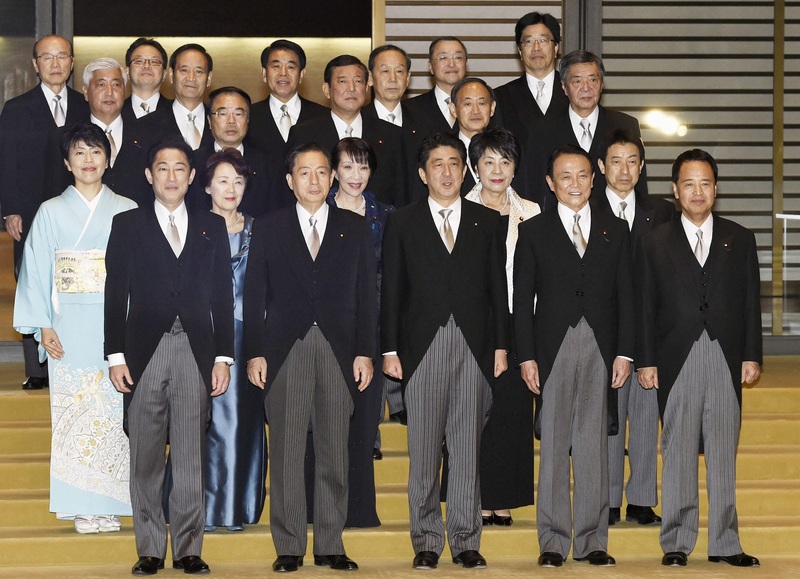 Diet members re-elected Shinzo Abe to the country’s top political post on Wednesday, and he wasted no time launching his new Cabinet. Following a landslide victory in the snap Lower House election on Dec. 14, Abe reappointed all members of his previous Cabinet except for Defense Minister Akinori Eto, who reportedly refused the post. Eto was replaced by Gen Nakatani, a Lower House member who in 2001 and 2002 served as the director general of what was then the Defense Agency under Prime Minister Junichiro Koizumi. In the Diet vote, Abe received 328 of the ballots cast by 470 members of the House of Representatives, against 73 for Katsuya Okada, acting leader of the main opposition Democratic Party of Japan. 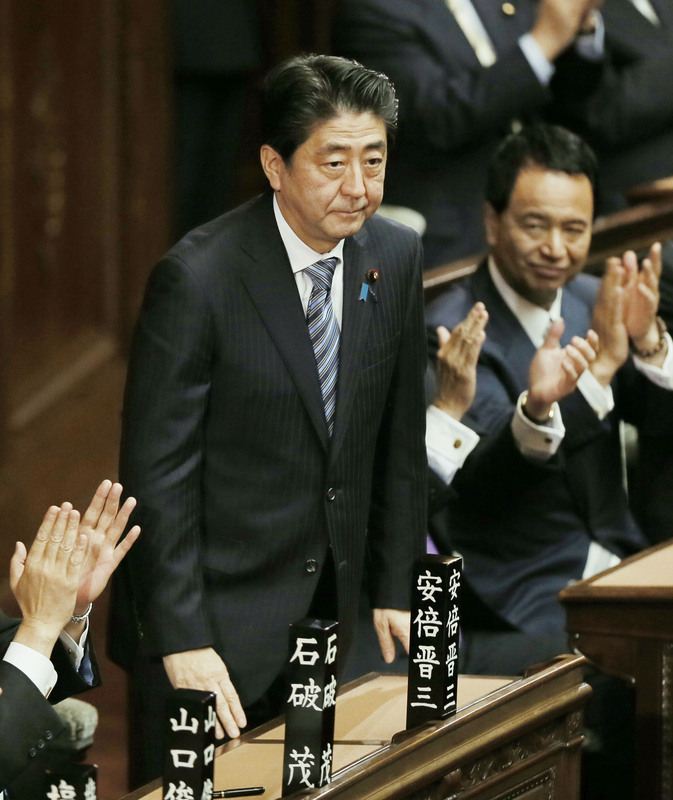 Abe also garnered 135 of the 240 ballots in the Upper House. Eto had been appointed to the Cabinet in a reshuffle in September but came under pressure from opposition lawmakers over alleged shady management of funds by his political support group. A graduate of the National Defense Academy of Japan and a former first lieutenant in the Ground Self-Defense Force, Nakatani will concurrently serve as the minister in charge of security legislation, which the Abe administration is expected to submit to the Diet in the spring. The 57-year-old from Kochi Prefecture helped the coalition navigate reinterpreting war-renouncing Article 9 of the Constitution, which it did in July. He played a central role in negotiating consent from the LDP’s coalition partner, Komeito. Nakatani is also working on revisions to the Japan-U.S. defense agreement. A new text was due by the end of this year but has been delayed until the first half of 2015. The agreement, last revised in 1997, spells out how the U.S. and Japan should work together when it comes to matters of defense, and the revisions aim to boost cooperation. Theoretically, Abe could remain prime minister until the next Lower House election, which is up to four years away. Although his term as Liberal Democratic Party president expires in September of next year, he is expected to be re-elected and to secure another three years as head of the ruling party. This means he could remain prime minister until at least the fall of 2018. 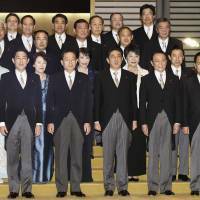 The reappointment of all 17 other ministers, as well as three deputy chief cabinet secretaries, apparently reflects Abe’s confidence that he can handle the Diet without interruption. This is in contrast with the turmoil prior to the Dec. 14 election, when financial scandals claimed the careers of several Cabinet members. Farms minister Koya Nishikawa was criticized for spending political funds on products and services from firms run by relatives, but he was nevertheless re-elected in the Dec. 14 election on an LDP proportional representation ticket. 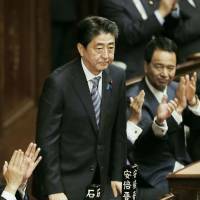 Although often portrayed as a nationalistic hawk, Abe has pledged to prioritize the economy, saying the new Cabinet’s top priority is to enact his “Abenomics” policies — super-aggressive monetary easing, greater fiscal spending and structural reforms, which he says are designed to raise Japan’s long-term growth potential. Meanwhile, the administration also plans to submit bills to expand the scope of the Self-Defense Forces, including allowing troops to act in collective self-defense. The bills, which critics say are anathema to modern Japan’s pacifist nature, are to be presented during the ordinary Diet session which starts in late January.